I love to help people and I love to teach and share. The classroom is the ideal place for us to meet. Together in the classroom setting, we use examples, exercises, challenges, and individualized and immediate feedback to help you better express what you want to say in mosaics. Andamento is the flow of the pieces within a mosaic. It's one of the unique characteristics of the medium, and a foundational tool to understanding (and expressing in) the language of mosaic. In this two day workshop, we do many hands-on exercises to understand how different tesserae (pieces in a mosaic) shapes and sizes interact with one another and create different effects. Instead of leaving with a mosaic, students leave with fundamental skills and information to make the andamento in their next mosaic *better*. I often call this the "a-ha" or "lightbulb" workshop, because of the number of comments I get about how people wish they would have known this information many mosaics ago. The fundamental building blocks of art (elements and principles) apply to mosaics and are often a missing piece of information in many mosaicists' tool boxes. In this 3-day intensive workshop, using many hands-on exercises, students learn about the elements and principles of art, material selection and planning, composition, and how to create a cartoon for their work. It's designed for students with little or no formal art education and participants range from beginners to advanced mosaic artists. During the course, students create a hands-on book, discuss how to look at an artwork, and progress through the entire process of developing a mosaic-ready cartoon, focusing on the process and decisions that are helpful to work through before cutting the first piece. For maximum effect, there is prework prior to the course, and students are encouraged to register early. I contact registered participants with details on pre-class preparation. It's SO much more than making reproductions! The "Ravenna" method is very helpful for any intermediate to advanced mosaic artist. 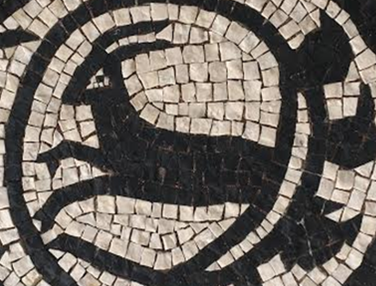 Just as the Direct and Indirect mosaic methods have advantages and disadvantages, the Ravenna Technique definitely stands on its own due to its unique benefits and is an often-missed skill set for mosaic artists. Come join me to learn how this lesser-known way of working can tremendously expand your toolbox. Complete details on class dates, times, and prerequisites are on the CMS site.